UN Women for Peace Association (UNWFPA) Chair Dame Muna Rihani Al-Nasser and President Barbara Winston welcomed 100 guests Monday night at Susan Gutfreund’s Fifth Avenue duplex in celebration of organization’s upcoming Awards Luncheon on International Women’s Day, March 8th. During the cocktail reception, Dame Muna Rihani Al-Nasser announced their Awards Luncheon honorees which include the First Lady of Panama, Lorena Castillo De Varela, for her work as a Special Ambassador of UNAIDS for Latin America and as global spokesperson for the Zero Discrimination Movement; Sheikha Rima Al-Sabah, National Goodwill Ambassador for the United Nations High Commissioner for Refugees; model and activist Ashley Graham; Leyla Aliyeva for her work as an FAO Goodwill Ambassador; and Eve Branson for her foundation’s work in the Atlas Mountains. Greg Kelly will be the Luncheon’s master of ceremonies. Susan Gutfreund is a Chairing the Awards Luncheon along with Cristiana Andrade, Geoffrey Bradfield, Francine LeFrak, Greg Schnackel, and Ling Tian. 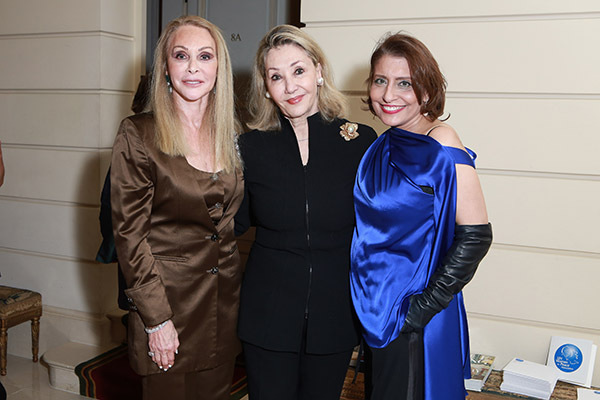 Guests at the elegant event included Rima Al-Sabah, Edgar Batista, Donna Corbat, Wendy Diamond, Anne Marie Dougherty, Olivia Flatto, Deborra Lee Furness, Avideh Ghaffari, Chista Ghaffari, Lucia Hwong Gordon, Michal Grayevsky, Michal G, Heffernan, Jana Jaffe, Pamela Johananoff, Larry Kaiser, Latifa Kosta, Pat Kerr Tigret, Ariel and Corinne Lahmi, Francine LeFrak, Julie Macklow, Geeta Mehta, Valbona Neritani, Ann Nitze, Vanessa Noel, Princess Katherine and Alexander of Serbia, Julie Perlman, Louis Perlman, Amelia Prounis, Lila Prounis, Anna Rhodes, Ralph Rucci, Dame Jillian Sackler, J Aida Shawaf, Julie Freedman Steele, Dexter Sun, Ling Tian, Dr. Steven Victor, Baroness Von Langendorff, Diana Wang, Bruce Winston, Helen Young, and Nassrin Iromloo Zahedi. UNWFPA’s board of directors include Mrs. Ban Soon-taek (Patron), Michal Grayevsky, Muna Rihani Al-Nasser, Barbara Winston, Rema DuPont, Valbona Neritani, and Stephanie Winston Wolkoff. Their Board of Advisors includes Katherine Stacy Deluke, Jana Jaffe, Avideh Ghaffari, Charlene Haroche, Deirdre Imus, Cindy McCain, Conchita Sarnoff, and Julie Friedman Steele. The UN Women for Peace Association, Inc. was founded in 2008 under the patronage of H.E. Mrs. Ban Soon-taek, the wife of UN Secretary-General Ban Ki-moon. The organization helps to advance the goals of academic and charitable organizations that provide opportunities for women to partake in the global peace building process through social, cultural, education and women empowerment programs.